The Soil Moisture Active Passive mission, or SMAP, launched in 2015 in order to map the amount of water in soils worldwide. On Friday, NASA announced that the agency is providing the mission with new tools developed by NASA's Goddard Space Flight Center that will better predict where there could be too much or too little moisture in the soil to sustain farming. “There's a lot of need for understanding, monitoring and forecasting crops globally,” said John Bolten, a research scientist at Goddard. “SMAP is NASA's first satellite mission devoted to soil moisture, and this is a very straightforward approach to applying that data.” NASA presents the satellite data in maps that are rendered to resemble watercolor paintings. Soils that are wetter than normal are seen in shades of greens, while those that are drier than normal are seen in shades of browns. Before this collaboration, the USDA had used computer models that would incorporate precipitation and temperature observations to indirectly calculate soil moisture. However, this approach was prone to error in areas that lacked high-quality, ground-based instrumentation to collect the data. 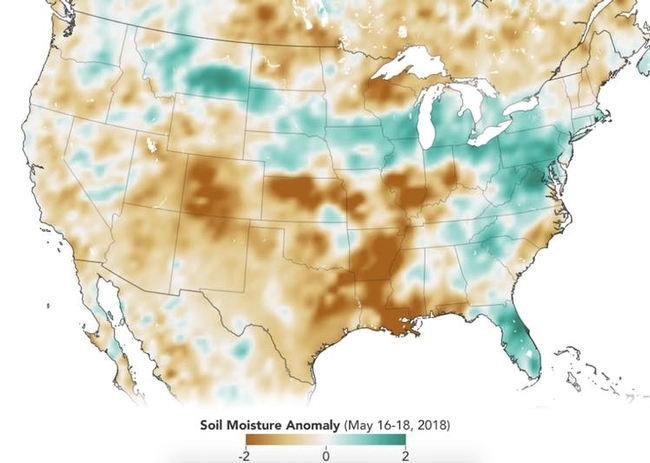 Now, NASA is incorporating direct SMAP data on soil moisture into Crop Explorer, the USDA's Foreign Agricultural Service website that reports on regional droughts, floods, and crop forecasts. The SMAP viewer is still in beta but is expected to provide updated global coverage every three days once it launches. The maps will be managed for NASA's Jet Propulsion Laboratory and will provide Crop Explorer with timely updates that are essential for monitoring conditions and forecasting productivity. This cross-agency collaboration will do more than help the USDA identify farming trends. By monitoring moisture in the soil globally, scientists can more accurately forecast conditions that could have tremendous economic and social impact. No matter where they grow in California, June is a month when avocados are being watered on a regular schedule. How regular that schedule is should be carefully reviewed by the irrigator. In 1991-'92, right along the coast in a Ventura irrigation plot, we applied 32" of water, but in '92-'93 we put on only 26". Same trees, nearly the same size, but a 23% difference in applied amounts dictated by differences in water demand due to different weather. The irrigation schedule we use is driven by tensiometers and a CIMIS weather station. The station generates reference evapotranspiration values which tell us how much water to apply at an irrigation, and the tensiometers are used to verify whether the trees are doing well by the schedule. Irrigation on a fixed schedule, such as once a week for 24 hours, is going to guarantee that on average you will be either under or over irrigating at each irrigation. Using some soil-based measure, such as a soil probe or tensiometer can assure an irrigator that trees are getting the appropriate amount of water when they need it. If you haven't done so, the irrigation calculator available at the Avovcadosource.com website can be quite useful in guiding an irrigation schedule - http://www.avocadosource.com/tools/IrrigationCalculator.asp - check it out. You also need to correct for salinity accumulation. In orchards which have not closed canopy yet, weeding is an ongoing activity. In a research plot, we are using tensiometers to monitor the effects of weeds, bare soil and chipped yard waste mulch around trees. In weedy plots soil moisture profile rapidly show 30-40 cbars of tension at 6", whereas the bare and mulched plots can go much longer before showing 40 cbars. Centibars is a measure of moisture tension, the higher the value, the drier the soil. As trees get older they make their own leaf mulch and shade which limit weed growth. There is no question that a cover crop can improve soil conditions through reduced erosion, improved water infiltration, and possible reduced disease and pest problems. These soil improvements tend to improve tree growth and orchard productivity. But, if water is the primary issue, weeds and a cover crop can add considerably to water use in an orchard, especially a young one. Weed control through the use of mulches and herbicides can effectively reduce the water requirements of trees. June is still a good time to replant an orchard. The soils are warm enough to give the trees a good start and there is enough fine weather left for them to establish before winter comes. Late plantings (September, October) are discouraged because the root-shocked plant sits in a cold, wet soil through the winter and becomes a prime candidate for root diseases. Especially in a replant situation, it is a good idea to start them off with a fungicide with one of the phosphonate products, to give them some protection until they get established. The best time for to apply the material to do its job on older trees is when there is a good root flush of growth which occurs after the leaf flush in spring and fall. When replanting, try as much as possible to avoid interplanting between older trees. The different water requirements of the young and old trees is such that one or both will be stressed because they need different schedules - less but more frequent for the young trees. Attempts can be made to put together a system where the older trees remain on the 10 or 15 gpm mircosprinkler and the young trees are put on a 1 gpm dripper. This still cannot be an ideal situation, since the needs for application frequency are still different between the small and big trees. The best thing to do is to clear out trees within an irrigation block and replant, or replumb a block with a new valve so that small new block can be irrigated differently from the older trees. Where clonal rootstocks fail in a root rot replant situation, it is invariably where water control is lacking or poor. As we all know, this has been a long dry spell in the avocado growing areas along the coast. With the levels of salt in our waters, it's important to have some kind of a leaching program to ensure that salts do not accumulate in the root zone. Each winter, rain leaches the accumulated salts from the previous irrigation season and starts the orchard off to a good start. These years it hasn't happened and one of the things that can affect the trees is a stress. This is a salt stress that is most pronounced at the end of irrigation lines and where low pressure results in low output, often at the top of the hill. Any irrigation system that has poor distribution uniformity is going to have areas where less water than average is applied. One of the responses of the trees to salt stress is to exhibit cankers in the branches. These can be silver dollar-sized cankers running in a line up the branch or as diffuse white spots in the branches. The first symptom is related to bacterial canker and the second is to black streak. These are not killer diseases, but they are reflective of the tree being under stress. As soon as the irrigation schedule is corrected, these symptoms can clear up in several months. If the schedule is not corrected the tress will begin losing leaves and sunburn can result. The symptoms of these two problems can be viewed at the UC Integrated Pest Management website - http://www.ipm.ucdavis.edu/PMG/r8100611.html and http://www.ipm.ucdavis.edu/PMG/r8100311.html. Again these are primarily stress-related diseases and the way to correct the situation is to improve irrigation distribution uniformity and the irrigation schedule. If it goes on too long it can cause problems especially in young trees. When you boil down farming to the basics, the most important activity in the orchard is ensuring proper irrigation.
. A rule of thumb is that irrigation should be done when about 50% of the water has been depleted from the soil in the plant's root zone. This 50% value, however, allows a buffer of water in the soil in case the weather suddenly turns hot and windy. 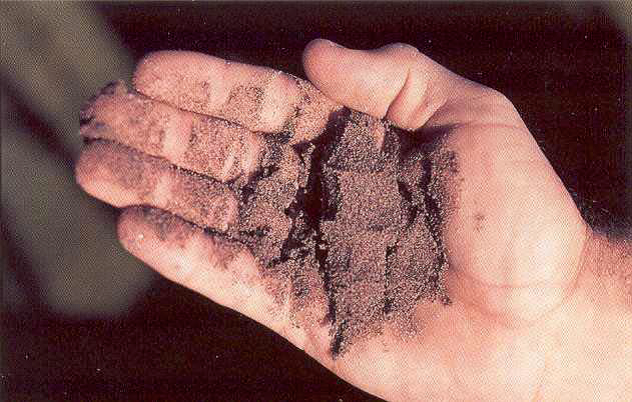 Sandy soils hold less water than clay soils and must be irrigated more frequently. A common misperception is that it takes more water to grow plants in sandy soil than in clay soil; however, the total amount required for the whole year is the same for both soil types. The amount of sunlight, wind, temperature, and humidity control how much water a plant needs, and the soil is only the reservoir. This method, however, gives only an approximate water content; instruments can give more precise readings. Irrigation timing can be determined more precisely using a tensiometer. These water-filled tubes with a pressure gauge accurately reflect the amount of energy a plant needs to extract water from the soil. The pressure gauge measures tension values in centibar units (cbars). For citrus, when the gauge reads 30 centibars, it is a good time to irrigate. 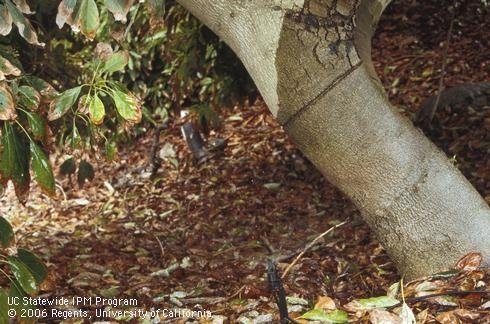 Tensiometers must be placed in the root zone between the emitter and the tree trunk. Having two tensiometers next to each other can be helpful in deciding when to turn the system on and off. For example, a tensiometer at a depth of 1 foot would indicate when to turn the water on, and a second at 3 feet would indicate when to turn the water off. Prevent tensiometers from being damaged during harvesting and other grove operations by placing a plastic milk crate or some other structure over each device. Other devices can also be used to measure soil moisture. Gypsum blocks are very effective; the part in the ground is inexpensive but the reading device costs about $250, so a relatively large acreage is required to spread out the cost of the system. Portable meters rely on an electrical current carried by water in the soil. Even cheap $10 meters can give a rough estimate of the soil water content, but they are not very effective in rocky ground, because their sensitive tips break easily. Soil-based methods monitor an aspect of soil moisture that, depending on the method, requires a correlation to plant water use. Some methods are well understood and inexpensive, others are expensive, inaccurate, inappropriate, or not well researched. Some methods allow multiple site readings, while others require a device to be left in place. Some measure soil water directly (e.g., oven-drying), and others measure another parameter, such as electrical conductance. Some methods are affected by salts or soil iron content, and others have limited value in the desired soil moisture range. Some, like tensiometers and gypsum blocks, give a reading from a porous material that comes to equilibrium with soil moisture, while many others use the soil directly as the measured medium—an important distinction, since discontinuities in the soil caused by rocks or gopher holes can affect readings. Also, some of the older techniques have been improved. For example, gravimetric oven-drying can now be done by microwave, considerably speeding up the process, and tensiometers and gypsum blocks can now be found with digital readouts and connections to data loggers that make data easier to manage. Many types of monitoring devices are available; the table below describes their characteristics. As with any tool, the value of these devices increases with use and familiarity. Even though several are stationary devices, by placing them in representative positions in the grove, they can accurately reflect the entire grove. Some types of device can be stationary or portable, depending on the model.